Have you guys ever hear of wheat germ? I just discovered it the other day. From what I have read on the internet, it is really good for you. You should look it up and read about all of the many nutrients it has and what kind of things it can do for you. I purchased a jar of it the other day and I have already used it twice. I added it to this granola and to some waffles. You can pretty much add it to anything. I am going to try it in some homemade bread. Just lessen the flour by however much of the wheat germ you add. Why not sneak in a little healthy ingredient here and there when you can? 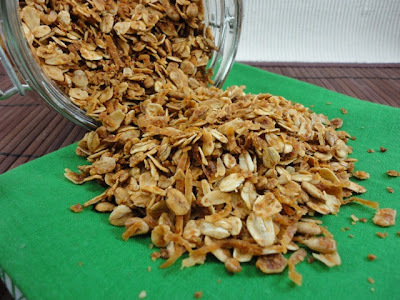 This is just a base recipe for granola and you can pretty much add whatever you want to it, like some dried fruit, banana chips, chocolate chips, chopped nuts or whatever you have on hand. There are many ways you can eat this too. Sprinkle it on some low-fat ice cream or add some to your yogurt. You could pour some milk over it and eat it as cereal for breakfast. You could even sprinkle a little over some muffin's before you bake them! In a large mixing bowl, combine oats, coconut, sunflower seeds, wheat germ and cinnamon. In a separate bowl, combine honey, vanilla and oil; blend well. Pour honey mixture into oat mixture and blend well. Spread on a baking sheet and bake at 350 degrees for 15-20 minutes, stirring every 5 minutes. Let cool, then store in an airtight jar. Makes 1 1/2 cups. Jenn's Notes: The original recipe says to bake 20-25 minutes and I baked mine for 20, which I thought was almost too done. Next time, I will try 17 minutes. It will get more crunchy once it cools. I added up the protein in all of the ingredients and this is what I got: 1 cup old-fashioned oats = 10 grams, 4 Tbl. wheat germ = 6 grams and 2 Tbl. sunflower seeds = 3.5 grams, making it a grand total of 19.5 grams of protein in just 1 1/2 cups of this granola. 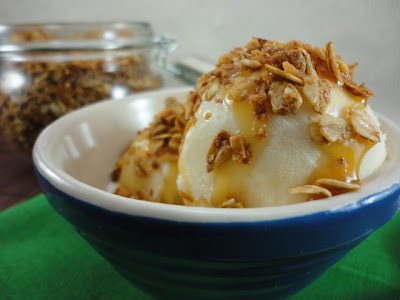 I love homemade granola on yogurt, I think it is better than you can buy. Your recipe sounds good!